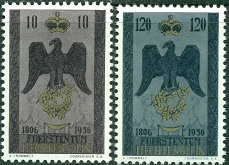 The two high-denomination Liechtenstein stamps shown above (Sc. #287-88) were issued on April 5, 1955. They were printed on thick, cream colored paper and were perforated 14 1/2. The 2 Franken denomination depicts Prince Franz Josef II, and the 3 Franken denomination depicts Princess Gina von Liechtenstein. These two Liechtenstein stamps are a little pricey, but hey .... we wouldn't want to make completing the modern issues of Liechtenstein TOO EASY .... there wouldn't be much of a challenge to it. If the collector really wants to spend a pile of money on ephemera items, it may be noted that these high-priced, high-denomination definitives were issued in sheets of 9 with ornate margin decorations, making them, for some collectors, collectible as miniature sheets or souvenir sheets. The second of the annual series of stamps featuring sports themes was issued on June 14, 1955. Each of the stamps shown above (Sc. 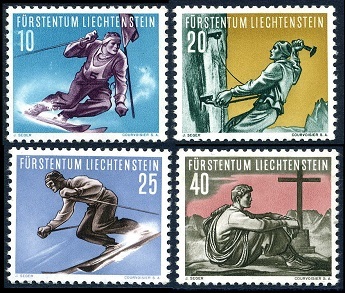 #289-92) depicts various Winter sports, as follows: Slalom (Skiing), Mountain Climbing, Downhill Skiing, and Resting on a Mountain Summit. The four stamps shown above (Sc. #293-96) were issued on December 14, 1955 to celebrate the 10th Anniversary of the Liechtenstein Red Cross, and they feature the children of the sovereign Prince and Princess of Liechtenstein. 10 Rp. - Prince Johann Adam. 20 Rp. - Prince Philipp. 40 Rp. - Prince Nikolaus. 60 Rp. - Princess Nora. 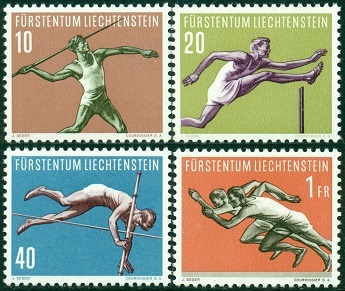 The third of the annual series of stamps featuring sports themes was issued on June 21, 1956. Each of the stamps shown above (Sc. #297-00) depicts various Summer sports, as follows: Javelin Throwing, Hurdling, Pole Vaulting, and Sprinting. The two stamps shown above (Sc. #301-02) were issued on August 21, 1956 to celebrate the 150th Anniversary of Independence. The geographic area that is now Liechtenstein was established by the Holy Roman Empire in 1719. In 1806, Liechtenstein was declared a sovereign state, thus freeing them from their political association with the Austrian Empire. This set of stamps shown above (Sc. #303-06) was issued August 21, 1956 to celebrate the 50th Birthday of Prince Franz Joseph II. The 20 Rp. stamp shown above (Sc. 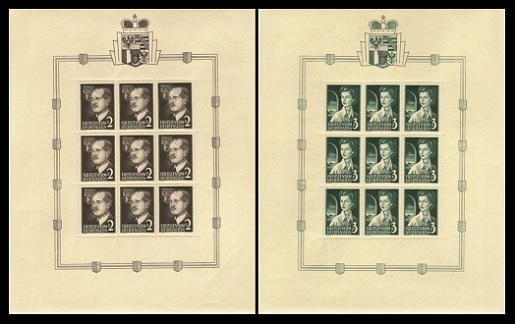 #307), featuring the portrait of the young Prince Johann Adam, was issued on August 21, 1956 to celebrate the 6th. 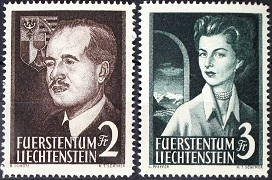 Lichtenstein Philatelic Exhibition in Vaduz, held from August 25 to September 2. This stamp was issued in sheets of nine, collectible as either miniature or souvenir sheets.